This week on the blog, I want to highlight Order of Odd-Fish fan art I’ve received that has to do with avant-garde pies. 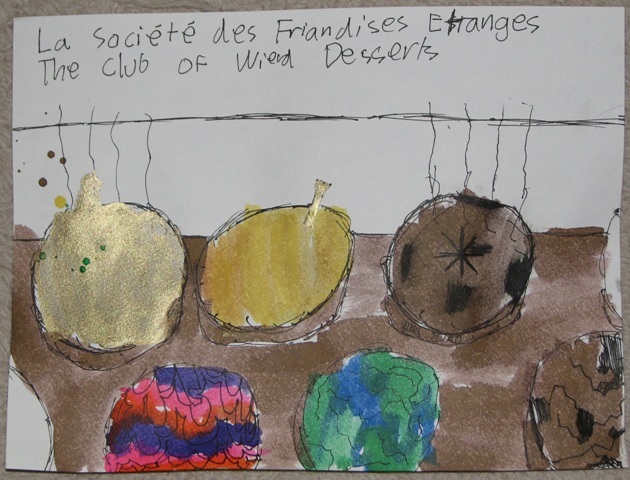 This first is by “Order of the Pie” founder (and eleven year-old) Mason, whose illustration of the La Société des Friandises Étranges chapter (above) was featured in April’s Odd-Fish fan art gallery show. I particularly liked Mason’s letter explaining his art, so I’m reprinting it below! Bonus: Mason’s mother is children’s book author Deborah Diesen, whose hilarious picture book The Barefooted, Bad-Tempered Baby Brigade is a favorite bedtime read of Baby Owl’s. Check out Deborah’s blog here! OK, take it away, Mason . . . I am a big fan of the book The Order of Odd-Fish. I decided to create this picture because in most fan art showcases, people usually draw stuff that’s important to the story, right? Well, I have decided to do the exact opposite because of this book’s dithering and bumbling yet captivating manner. If I were doing fan art for any other book, I would have drawn the main character, or the most important part of the plot. Instead, I have done the exact same thing a knight of The Order of Odd-Fish would have done. I have drawn some of the pies featured in The Club of Weird Desserts, and come up with some pies to put in the drawing as well. I drew this because I am the founder of the not-so-secret-anymore organization, The Order of Pie. Molten Money: The filling is made out of pure 24 carat gold. Total Taste Sensation: This pie is made of a substance that activates dormant taste buds on the inside of your bloodstream. Chocolate Hell: The filling is made of chocolate heated to a temperature hotter than the surface of the sun, and sealed inside the pie so that not even one degree of heat can escape from the pie. The Calibrated Cataclysm: Juicy quinces and persimmons soaked in liqueurs measured out in single angstrom drops, served flaming in a dish of richest creams. The Phosphorescent Fascination: Made out of an edible plastic made out of Neptunium, a radioactive material. Mr. Kennedy, I liked your book because you could not count on it for anything. Of all the books I’ve read, this one is like no other. That’s a good thing. P.S. The Order of Pie is an organization dedicated to making pies. I am currently trying to locate a headquarters for this organization, other than my Mom’s basement.